"Do you have a book about angels for someone who’s a complete beginner? "Doreen Virtue frequently hears this question at her workshops, and usually points them to her book Healing with the Angels. Yet, even that book is a bit advanced for newcomers. One morning she clearly saw and heard the title Angels 101, and Doreen knew that the angels wanted her to write a very basic and elementary book. 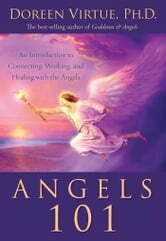 Angels 101is a nondenominational overview of who the angels are; their role in various spiritual texts and religions; the ways that angels help us and how to call upon them; information on guardian angels, archangels, and departed loved ones; and frequently asked questions about the angels. No matter where you are on a spiritual or religious path, this book is sure to deepen your understanding and love of the angels—and it makes the perfect gift for someone new to these concepts! The Answer Is Simple#Love Yourself, Live Your Spirit!